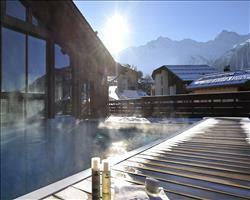 This stylish residence and hotel has a wonderful location on the piste above the village of Arc 1800. It has been sympathetically constructed using local stone and wood, providing a high standard of accommodation which is proving a popular choice for our guests. Unwind after a hard days skiing at the indoor swimming pool, sauna and steam room (massages can also be booked and paid for locally) or take the ski bus, which stops just outside the property, into 1800 to check out the local restaurants and bars. Wanting to stay but looking for bed and breakfast or halfboard catering and hotel service? Check out the Eden Arc apartments sister property the Apart-Hotel Eden. 2-room Apartment (A4) 36-43m² - sleeps 2-4: Living room with two sofa beds and separate bedroom with double bed. 3-room Apartment (B6) 50-56m² - sleeps 3-6: Living room with two sofa beds, bedroom with two single beds and bedroom with a double bed and en suite bathroom. Superior 3-room Apartment (C6) 60-70m² - sleeps 3-6: As type B6 but more spacious. All apartments have fully equipped kitchen with ceramic hot plates, multifunction oven, fridge and dishwasher, flat screen cable TV with international channels, bathroom with wc and free wireless internet access. Included: Bed linen and towels. Beds made up on arrival. Free welcome drink at 6pm on Sunday. Local Expenses: Refundable deposit €300 (credit card accepted). Resort taxes. The apartments are offered on a self catered basis with an option to upgrade to half board. Half board is taken in the Hotel Eden's restaurant Voga Goga (on site) with table service and choice of dishes. We update Edenarc Apartments (Arc 1800)'s details often, but facilities do change. e.g. some extras listed by the supplier as "free" or included might only be for the first time you use them, or for one time per party, then charged for further use. If any specific feature is essential to your holiday, make sure you ask us to confirm the details of it before you book your holiday. This package holiday to Edenarc Apartments (Arc 1800) in Les Arcs, France departs Saturday 13th April 2019, for a 7 night stay on a "self catering" board basis. A local tourist tax (Taxe de Sejour or Kurtaxe) is levied by many councils in European ski resorts. It varies by standard and type of accommodation and is age dependent, so not everyone is charged. It's not included in the basic price of your holiday and is usually paid locally. For reference, the average charged in winter 15/16 was between 50p and £2 per person, per night. One half of the magnificent Paradiski and the self-professed 'home of snowboarding', Les Arcs has well earned its reputation as one of the best and biggest ski destinations in France (and if you ask us, the whole wide world).
. Ask for a quote when booking Edenarc Apartments (Arc 1800). Les Arcs has N S E W facing slopes. Club Med Peisey-V... Les Arcs France, Without Flights to Without Flights 20th April. I’d buy one and live there if I could! The apartments are very well designed and easy to clean. They have full size bedrooms and comfy sofa beds, stone decor and a lovely kitchen layout. The swimming pool, sauna and steam room were all good. Glorious ski in, ski out location, one ski hire shop is part of the building and there’s another within an easy stagger. The restaurant and food shops are ok, and it’s served by a cable car if you want to get shopping. There’s a nice area for families opposite which had a toboggan run, a ski speed run, a nice gentle green and blue and also a swimming pool. I can’t think of any criticism other than that it would have been nice to have some sort of welcome pack as we didn’t get there until 10:30 in the evening. Also bring toilet paper – it would have been good to know this and bring some with us rather than having to go back out to get some. "Liked having a pool and sauna"
We had a really good week here, it was nice to have the sauna and swimming pool (the pool did get quite busy but that was as expected). The apartment itself was really clean and everything was in order. I got the short straw with the double fold out sofa bed which actually turned out to be the better mattress! Compared to apartments we’ve stayed in before, we weren’t presented with a long list of things we couldn’t do the moment we arrived (which can be a bit overwhelming). The average person isn’t going to trash the place and it was nice not to be inundated with rules as soon we got there. The apartments are ski in, ski out (anyone could manage it) and it’s a small work down to the village if you’ve got the legs for it, or alternatively there’s a frequent bus service. The walk was quite steep as you’re pretty much going down the ski slope, but it was actually a good laugh going down there every day! I’d recommend the bread service in the morning, it was really nice to have fresh bread and we could make our own sandwiches for the slopes. "Excellent apartments with ski hire shop on site"
The apartment was excellent! The amenities were very good and the apartment was spacious. We were very happy with it. The only thing I would point out is that they asked us to do an inventory when we arrived and there were quite a few things that were broken or missing – like the toaster didn’t work and the window was cracked. Shouldn’t the people that run the apartments be doing that themselves? They did sort things out quickly though once I had reported it to reception. We had read good reviews of the apartments before we booked them, so we knew they would be good, and they came with a dinky fridge and freezer and everything we needed. The bus stopped nearby and went every 20 minutes or so. The last bus ran at 11:30pm, so we could go over to the next village for a drink in the evening. My son went to watch the footie. You also had to take the bus to get to the supermarket. We cooked ourselves mainly because it’s so expensive to eat out. There wasn’t much around but there’s a little bar opposite which is handy and they do lovely pizza. There is a Ski Republic hire shop inside the apartments (on the car park level) and I pre-booked our ski hire through them. We got a good deal – I think it was 3 for 2 on ski hire and free helmets. They let me change my skis around too because I got the advanced pack. This was my first time self catering so I can’t really compare it to anything else, but I really liked it! The apartments are all really new and everything was very clean and functional. It was really nice to be able to use the swimming pool which had a little outdoor bit. The apartments are ski in, ski out but the town, shops and restaurants are probably a 10 minute walk away down quite a steep hill – I would definitely recommend getting the bus back up! With a lot of apartments you tend to get sofa beds but the nice thing here was that we had 2 separate rooms, which worked really well being a group of 2 couples.